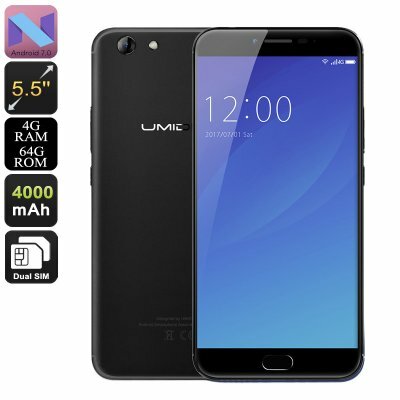 Successfully Added UMIDIGI C Note 2 Android Phone - Octa-Core, 4GB RAM, Android 7.0, Dual-IMEI, 4G, 13MP Camera, 1080p (Black) to your Shopping Cart. Stay connected to friends and family with the UMIDIGI C Note 2 Android smartphone. This latest Android phone packs a whopping 4000mAh battery. With this cell at your side, you can enjoy up to 12 hours of continuous usage time. This is enough to get you through multiple days of regular smartphone usage without needing to recharge. From now on, you no longer have to worry about running out of juice during the day. The phone comes with Dual-IMEI numbers and 4G support. Therefore, you can be guaranteed that you’ll always be within reach to friends and loved ones no matter where you’re at. On the 5.5-Inch display of this latest Android phone, you will be able to undergo a stunning visual experience in crisp 1080p resolution. With this smartphone at your side, you can enjoy films, series, and games at any given moment. The phone treats you to 64GB ROM and an SD card slot for all your storage needs. Simply head out to the Play Store and download your favorite media. With the UMIDIGI C Note 2 at your side, you’ll never have to experience a moment of boredom again. This Android phone comes packed with an Octa-Core processor and 4GB RAM. Along with its Android 7.0 operating system, it is guaranteed to deliver a smooth yet powerful performance. Whether it’s games, movies or Apps – this Android phone supports it all. It even comes with a 13MP rear camera that lets you shoot breathtaking images and Full-HD video. With this snapper at your disposal, not a single special moment in life ever passes by again without you taking the perfect picture. The UMIDIGI C Note 2 Android Phone comes with a 12 months warranty, brought to you by the leader in electronic devices as well as wholesale Android smartphones..